Like the Heroes calendar, Capcom’s 2012 Girls Calendar featured its own Rockman panorama, this one by famed Rockman Zero series artist Toru Nakayama. Taking up the highly contended for New Years/Valentine’s Day position, no less! Not quite as comprehensive as the boys’ side. This one has representations from more of the different subgroups of Rockman, but includes far fewer faces. Some big names like Alia, Leviathan, Splash, and Kalinka didn’t make it in, while two versions of classic Roll did, but I wouldn’t change a thing. Nakayama’s cheery bubblegum take on the characters makes me smile. Especially one little lady over in the corner there. Oh Aero, you are not forgotten. 11 Comments to "Toru Nakayama’s Women of Rockman"
Me too. 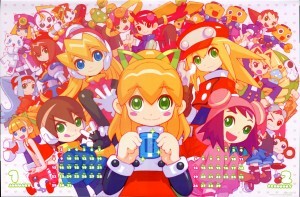 Makes me wish there was a Rockman girls-focused manga, like they used to do. The old Capcom ones were most often dominated by Street Fighter and Vampire characters. Very cool, was this calendar released digitally?, because it looks to clean if that’s a scan. Thank you! It’s really just another scan and stitch though. The program I used must have cleaned it up pretty well. And here I was worried that all the bends along the edges would make it really stand out what a poor scanning job I’d done. It is too bad they didn’t make some kind of digital release for these, huh. I have an Epson 330 scanner that came with software called scan-n-stitch deluxe. I scaned them in sections, I think it was at 300 dpi? Something like that. Then arranged them in order, and the program does the stitching. Thanks a lot man. Bad news is: I haven’t received that thing. Trust me on this one: never ever ever ecer ever ever ever trust mexican mail companies. Too bad I can’t enter the US. Speaking as someone who has also lost precious cargo to shaky domain of foreign shipping and handling, you have my sympathy sir. The giant Rockman Zero character eyes can be creepy seen on other Rockman franchise characters.